Sometimes you come across an ingredient that doesn’t need much primpin’; the shishito pepper is one of them. This is the perfect pepper for anyone who doesn’t like spicy food, yet enjoys the flavor of a pepper. Shishitos are super tame; in comparison to the jalapeño on a reference scale, the typical shishito pepper is 13 to 160 times milder. HOWEVER. One out of every 10-20 shishito peppers will surprise you with some extra heat. They still don’t reach even mild jalapeño heat, but it’s enough to catch you off guard! Anyone up for a game of ‘Pepper Roulette’? 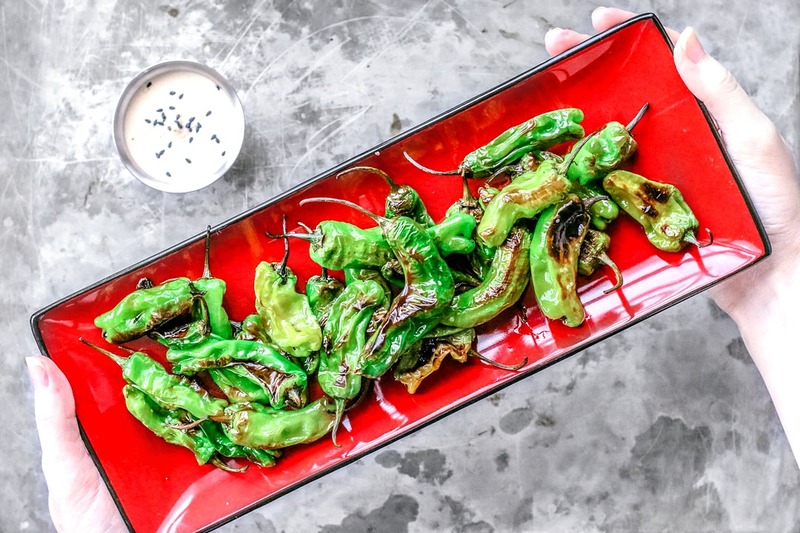 With a simple toss in olive oil and a generous sprinkle of coarse kosher salt, these shishito peppers get the broiler treatment until slightly blistered, a little crisped, and an awful lot addicting. They make for a great appetizer or snack, and though they’re no-frills, there’s something rich about the fact that you can enjoy these bites in the simplest of forms. Roasted shishito peppers don’t particularly need a sauce to be enjoyed, so the sauce is optional, but I’m a bit of a dip fiend; I’ll take any opportunity to whip up a creamy and dreamy dressing. This one is savory, slightly punchy, and scrumptious AF. If you’re a dippin’ maniac like myself, I definitely recommend it. These Roasted Shishito Peppers With Sriracha Soy Dipping Sauce are a perfect appetizer or snack. They're fuss-free and only take minutes to prepare. Pre-heat your oven's broiler to high and arrange the top rack to sit about 5 inches from the broiler. Place a large cast iron skillet (or baking sheet, if you don't have a cast iron skillet) under the broiler to warm it up. Place the peppers in a mixing bowl and hit them with the cooking oil. Toss to coat. Give them a generous sprinkle of coarse salt, and toss again until evenly coated. Once the skillet is hot enough (to test, flick a pinch of water into it and if it sizzles and evaporates upon contact, it's ready), carefully transfer the peppers into the skillet. Be careful when doing this; the pan is very hot and the peppers will sizzle on contact, which could cause the oil to spatter a bit. Place the hot skillet with the peppers back into the oven beneath the broiler. Let them sizzle for a few moments before stirring them around so they char on the bottom. About 2.5 - 3 minutes in, carefully stir the peppers around with a spatula and allow them to cook for another 2.5 - 3 minutes, or until the peppers are mostly blistered. Once the peppers are ready, remove them from the oven and carefully transfer them from the hot skillet to a serving plate. Give them another sprinkle of salt if you wish, and serve with a bowl of dipping sauce (optional). In a small bowl, mix all of the ingredients together and stir until well blended. Garnish with sesame seeds. Cooking oil: Technically olive oil isn't ideal for high-heat cooking, but like many, I'm in love with its rich flavor which pairs oh-so-well with these salty peppers. If you're not into using olive oil for high temps, opt for peanut oil or grapeseed oil. We grew these peppers for the first time this summer. This recipe was perfect and exactly what we were looking for!! Love, love, love this recipe!!! Although I love the little dip recipe, too, I think the simplicity in just broiling the peppers with salt and oil is what I like most. The pics are beautiful!! What stunning pictures! The red and green really pop. I'm a huge fan of all peppers, mild and hot, so this is something I'll have to make soon. Oh my they look delish, I have had them the very first time in Barcelona. I am surely going to try making this. Thank you.